Volkswagen's most popular car in America has gotten a thorough revamp to send stagnation to hell. The improvement of Volkswagen’s bread and butter vehicles seems to follow a predictable growth curve: throw it on the group's newest shared modular platform, make many subtle updates to the styling that add up to fresh, attractive, and modernized face, throw in the latest and most fuel-efficient engine, and add plenty of technology. And now that Volkswagen has a on the market, it’s decided to turn that same tuning fork to America’s most popular VW product, the Jetta. 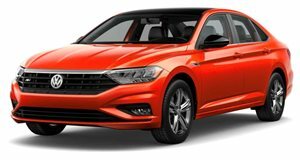 The compact sedan gobbles up the majority of vehicle sales for Volkswagen in the US, and found that its popularity boils down to the fact it's secretly a budget 3 Series. To applaud our enthusiasm for the Jetta, VW has decided to unveil the 2019 Jetta at the Detroit auto show. Resting on the flexible MQB platform, the 2019 Jetta takes cues from the Arteon, retaining a coupe-like roofline made all the more sporty by short overhangs. With a longer 105.7-inch wheelbase (up from 104.4-inches) advertising the fact that this Jetta grows outwardly in every direction, the result is a not-as-compact compact sedan with more interior space that occupants are sure to love. LED lighting compliments the bold grille to make the Jetta look intimidating in rear-view mirrors, but the 1.4-liter turbocharged TSI engine ensures it won’t stay there for long. With 147 horsepower and 184 lb-ft of torque going to the front wheels via an eight-speed automatic transmission and—wait for it—a six-speed manual, the Jetta will pack a punch when needed but remains polite and polar bear-friendly around town. R-Line buyers might be the type to take advantage of that horsepower, but the slew of interior upgrades ensure that there’s something S, SE, SEL, and SEL Premium buyers can appreciate too. Trapezoidal design elements mix with soft-touch surfaces to lend modernity the comfort its cold, calculating sprit sometimes lacks. New fabric colors, trim pieces, and a 10-color ambient lighting system give buyers a greater degree of customization before and after the purchase. The driver-oriented cockpit sees an infotainment screen perched high on the dashboard for easy accessibility while those that opted for the SEL trim or higher will appreciate the Volkswagen Digital Cockpit display, a lightly distilled version of Audi’s Virtual Cockpit Display. This enables the driver to see vehicle information, navigation instructions, and multimedia settings on a single adaptable screen behind the steering wheel. To avoid constant settings changes, the Jetta allows up to four drivers to store seat settings, driver assistance system preferences, ambient lighting choices, radio presets, and more. Weaving the threads of technology, safety, and driver interaction together in an intuitive way is what the 2019 Jetta strives to do by offering Apple CarPlay and Android Auto along with options like autonomous emergency braking in case the forward collision alert didn’t do its job, blind spot monitoring, rear cross-traffic alert, adaptive cruise control that works in stop and go traffic, lane departure warning, and automatic high beams. If that’s all too much, occupants reserve the right to tune out the complexity and turn up the available 400-watt Beats sound system to enjoy the ride. If life decisions like that trickle your fancy, then be on the lookout for the 2019 Jetta in the second quarter of 2018.